My latest project in the list-world is related to books to use in speech-language therapy. 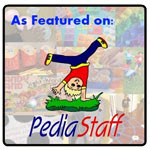 This project has taken me about a month to complete researching what children's books are out there related to social skills, speech-language disorders, grammatical skills, articulation, receptive language skills, and more. To compile my lists, I sifted through my own speech classroom library (which I have been documenting for two years in an Excel document), looked through the Pinterest "speech books" board that I have compiled for the past year, searched on Amazon.com, and looked at other documents/websites that compiled speech book lists in the past. 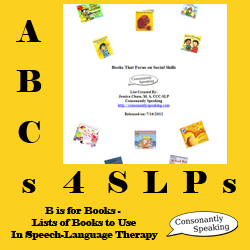 Continue reading to download the book lists for speech-language therapy! Books are categorized by sound, skill, or disorder depending on the list. To save the documents to your computer, you can click on the links at the end of the post and they should bring up a window asking you where you want to save it to (or it may just open the file and you will have to click the "save" button in Adobe). You must have Adobe Reader or Google Chrome to view these documents. Feel free to download and use this resource. Feel free to pass on the link to my website. You do not have permission to alter my documents, claim them as your own, or sell it for profit. I have worked for a month or so on these lists in my spare time over the summer, so if you feel that they have been helpful, there is a PayPal button at the end of this post as well as on the right hand side of the page if you would like to donate a dollar or two. It would really mean a lot to me and help with the upkeep of this website. 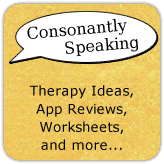 Feel free to comment with any other books that I missed or comment as to whether or not this will help you choose appropriate books for speech-language therapy! I am always looking for feedback, especially when I have spent a significant amount of time on something!